There is a considerable body of evidence surrounding the gardens of ancient Rome that details the various elements that comprised their pleasure and villa style gardens. Many classical features are found in today’s gardens and landscapes paying homage to those ancient stylized Roman gardens. The following article discusses ways you can transform your garden or landscape into an ancient Roman pleasure garden filled with elements reminiscent of that glorious past. While inhabitants of the city of Rome frequently employed courtyard (as above) and kitchen gardens, it was the inhabitants of the Roman countryside who perfected the pleasure garden that ancient Roman villas are noted for. These gardens were so beautiful that even the ancient Barbarians who conquered Rome kept them up and learned from their design. Today, gardeners opt for many various themes when designing their own garden or landscape; a roman style garden, because it is classical, will never go out of style and many elements that are reminiscent (mainly reproductions) of the era can easily be found online or at local garden centers. The overlying ideal of the pleasure garden was for relaxation and rejuvenation. Entertainment was also at the core of the design. The owners of these elaborate villas usually entertained guests and the garden was the ideal place to entertain them. Certainly, the orchards and vineyards were productive and useful to provide the banquets with an abundance of fruits, vegetables and wine. Nevertheless, the idea of the pleasure garden was to showcase the landscape with many beautiful features and breathtaking views. There most likely would have been a dining area’s low tables with low couches. Garden furniture is widely available today so purchasers have a good selection. However, to find something in a truly authentic Roman style, you might warrant a custom job when it comes to furniture. Nevertheless, always opt for lavishly comfortable styles when selecting furniture for your own pleasure garden. Other patio features would include stone planters, a water feature like a chalice well, basin or wall fountain. While there is not a wealth of information surrounding the ancient Roman pleasure gardens, there is enough information to suggest that the patio opened up to a grand landscape that was designed in all directions. A walk would be the main element of the grounds for seeing each garden delight. Generally, the property would feature a terraced section, an orchard or vineyard (probably both), a kitchen garden for herbs and vegetables (this might not be a part of the grand garden tour however) and various sections that might contain prized plants like roses. The center of the garden would also feature a special element like a fountain. Other important features might include shrines and grottoes. 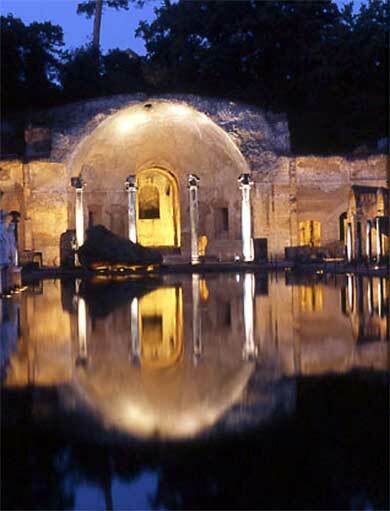 Water was prized in all styles of Roman gardens by the ancient Romans who were the aqueduct builders of the old world. A Roman pleasure garden would boast several water features on the property. In fact, each view might contain its own water feature. From the central fountain to a stream running down the terrace, to a garden pond to an elaborate pool that was an important social element of the Roman world. When considering water features for your landscape, work with the land, but also with a view for the types of entertaining you will do. 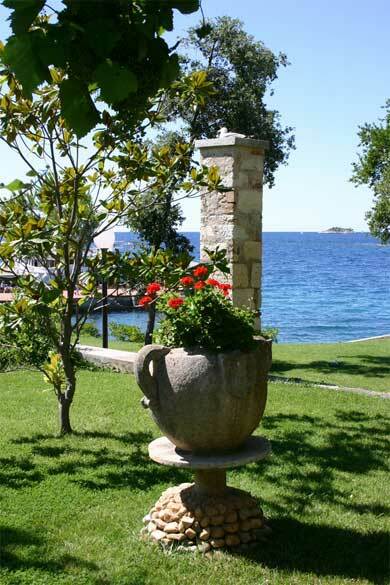 Water is an essential element in Roman Gardens. As for the types of plants, you will certainly want to adapt plant life to your climate but some typical Roman choices would include roses, cypress, rosemary, mulberry and fig trees, dwarf variety trees, tall trees, marigolds, hyacinths, narcissi, violets, saffron, cassia, thyme, and many more. Your pleasure garden should be well-kept and each section should feature its own scheme of plantings. Flowerbeds, groves and water-loving plants should all be included. Finally, your ornamentation will go a long way to capturing that ancient Roman feel. Your garden walk might contain hidden arbors with stone benches, various classical figures carved in stone, and perhaps even ruins like a column base implanted somewhere in the landscape. Finally, birds were welcome attractions for the guests of these ancient villas, so consider features that might attract various kinds of wildlife such as birds and other desired animals.